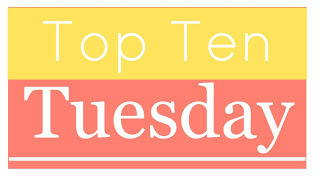 This week’s Top Ten, brought to you by The Broke and the Bookish, will be muy difícil. I have read around 180 books (so far! Snap!) this year, and have enjoyed so many of them. Using my new pal, Goodreads, I sorted my list of books reads by rating. I have removed those books from the running that I read for a second time, and then, had to search through those rated Four Stars to find the rest. I am going to put them in alpha order, because making me list them in order of preference would just be rude. The Abandon series by Meg Cabot. Surprise! I am again cheating. There are a few books that I have read that are in a series, and since I have given them all the same rating, I am allowing myself to lump them together. I really like this series because it has all of the Greek myth lore. While the same formula may be present (abilities, paranormal aspect, bad boy meets good girl), the narrative makes it all fresh and new. Abandon and Underworld have both been released; Awaken will be released May 7, 2013. Grave Mercy by Robin LeFevers. Beautiful cover. Great story. Historical, but not in an annoying way. Did I mention, great story? The Graveyard Book by Neil Gaiman. Are you all sick and tired of me including this gem on every one of my lists? The Infernal Devices series by Cassandra Clare. Seeing Clockwork Prince at the bookstore last Christmas got me started on my wonderful Cassie Clare odyssey. And while I am tired of love triangles (or, as comedian Demetri Martin points out, it is really a love angle, otherwise the two who are in love with the one would also have to be in love with each other), the one in this series makes sense and is heartbreaking. Also, the covers on all three books are some of the most breathtaking around. The Mortal Instruments series by Cassandra Clare. Yes, the “I didn’t know I had powers!” plot has been used a lot, but this series is so much more than that. There are so many twists and turns, new vocab to learn, it has all the major paranormal groups and it puts the fallen angel/Nephilim device to great use here. Hopefully the City of Bones movie follows suit. The Perks of Being a Wallflower by Stephen Chbosky. Speaking of heartbreak…this story felt so real. It made we want to go back in time and hug everyone at school who felt on the edge of things. This story has an old-school vibe, like something written in the 70s, while retaining its relevance. Didn’t you just want to scoop up Charlie and squeench him and protect him? Quarantine: The Loners by Lex Thomas. Another book that I read in anticipation of the Austin Teen Book Festival, I am sure I would have never chosen to read this one on my own. Violent and frightening, this book takes a page from Lord of the Flies, glances at it briefly, and then leaves it in the dust. This is high school cliques on steroids. Something Like Normal by Trish Doller. A very timely contemporary novel about the return of a soldier from the Middle East. The main character not only has to deal with everything at home that he ran away from, he has to do it while suffering from PTSD. Honest, unflinching, heartbreaking, hopeful. The Storyteller by Antonia Michaelis. A spellbinding, horribly wonderful book. The story thrust its fist into my chest, yanked out my heart, squeezed it as hard as it could, put it in the food processor, poured it back in and then hugged me while I cried. You may never want to read it again, but you will be glad that you read it once. What are your top ten? I am starting to amass a list of to-reads for 2013, and would love to find out about anything I haven’t read yet!